Sydney is probably one of the most beautiful cities in Australia. It is multicultural and diverse city that charms those visiting it by offering endless forms of entertainment and relaxation. Sydney is an incredibly big city filled with museums, art exhibitions, art galleries, restaurants, cafeterias and of course clubs. 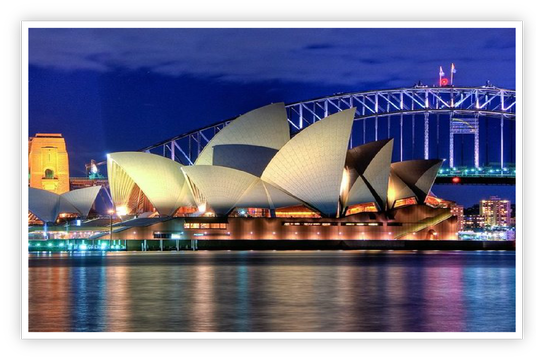 The famous Sydney Opera House produces amazing shows and at the same time its recognizable building is probably one of the most famous contemporary buildings of the world. The city of course is full of historical buildings and parks that are a great entice to visitors. The Sydney harbor is definitely a place worth visiting in order to admire its arch bridge. Moreover the city Zoo and Aquarium are also worth a visit. The beaches of Sydney which are not located far from the city attract innumerable people and are simply amazing. If you wish to get to know the city of Sydney and experience intense and wonderful holidays filled with memorable moments all you have to do is book now a your air ticket. All the above airlines are landed at the International Airport of Sydney Kingsford Smith (more information below). When making plans for a holiday trip to Sydney it is better to make a reservation as soon as possible in order to find cheaper air tickets. Many airlines promote cheap flights and announce special air ticket offers for reservations made 1 or 2 months prior the departure. The International Airport of Sydney is a very important airport with millions of visitors through the entire year. The airport has 3 terminals and many services for travelers. Terminal 1 (T1) facilitates many international flights and all the terminals are connected via special airport shuttles. Inside the airport there are many restaurants, cafeterias, snack bars, storage rooms, ATM machines, shops, information desks, travel agencies and of course ticket desks for flight reservations. The public transport system in Sydney is very efficient with regular schedules and it is an easy way to transfer from the airport to the city since their distance is only 8 kilometers. The airport railway line that stops in all the terminals has as its final destination the city centre (Sydney Town Hall) and there is a train every 10 minutes. In T1 the train station is located at the same level as the arrivals. The journey lasts 15 minutes and the ticket costs AU$11.00. The airport’s terminals are connected via a shuttle that operates from 05:00 until 00:00. The route lasts a few minutes and the ticket costs AU$5.00. There are also many bus lines that have services from the airport to Sydney (Bondi Junction and Burwood). The journey to the city’s centre lasts 20 minutes. In case you choose a bus for your transfer from the airport make sure that you have a reservation. There are always available taxis outside the airport’s arrivals and many legal taxi companies. At the taxi station there are people to help you find a taxi and board on the vehicle. The journey from the airport to the city lasts 30 minutes and can cost AU$50.00 or more. Have in mind that there is an extra charge (AU$3.00) for boarding from the airport.